She was driving a minivan believed to be owned by Rowan County Chief Deputy Clerk Kimberly Davis, her mother, who also happens to be running for Clerk. She has refused to help Madden retrieve his dog and has gone so far as to call the police on him for begging for assistance. 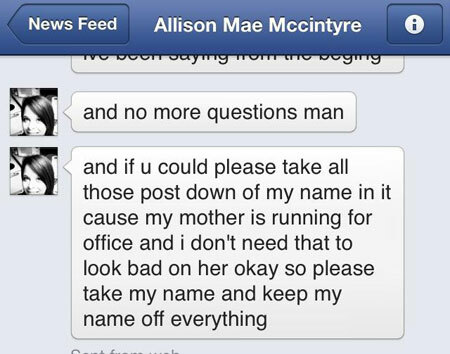 Allison (the alleged dog snatcher), according to security camera footage, put the dog on her own leash and fled with him, never asking if anyone was the owner of the dog, never calling BP to see if anyone was looking for their dog. Madden, prior to going public with his heart-breaking search for his dog, offered her cash for his dog to no avail. Now he’s offering a reward to anyone who can return him. It’s beyond sad. But what takes the cake is that Ally Mae Davis/Allison Mae Mccintyre admitted to Madden that she was the individual in the surveillance snapshots. 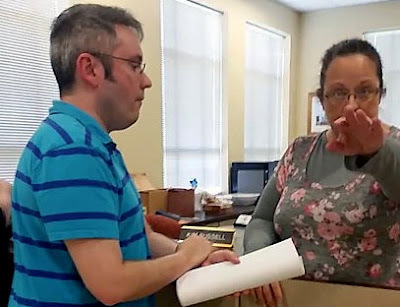 Remember the daughter of Kim Davis, who stole Ross Madden’s dog in Morehead last year? Nothing ever happened to her. The dog was never recovered. Local police officers and the sheriff sat on their hands. The County Attorney, Cecil Watkins, recused himself and pushed everything to Carter County. The Assistant County Attorney there also sat on his hands. Why? Because Eastern Kentucky is a pustule of awful. Everyone turns a blind eye to corruption. When their friends or children of their friends get caught? They sweep it under the rug. So we thought it’d be a good idea to revisit that sad mess by pointing out that Kim Davis barely squeaked by in her primary for Rowan County Clerk. NOTE: I've not found any substantiating reports regarding the above claims.